Your body is like a car. Before you can repair it, you have to understand how it works. This owner's manual starts with the DNA blueprint for your body and ends with amino acids, the building blocks for the proteins that do the work in your body. This owner's manual also contains a troubleshooting section that focuses on amino acids. Having a look under the hood will help you create better and longer lasting repairs that really get at the root of the problem. Your DNA contains the genetic blueprint for building your body, not only instructions for building for every cell, but instructions for regulating how cells work together to promote growth, development, functioning and reproduction. Your DNA is what makes you human. Chromosomes are in large part made up of genes. A gene is a small section of a chromosome that passes along a specific inherited trait or contains the blueprint to make a protein. Genes have a starting and ending point on a chromosome. There are about 20,000 genes in human chromosomes. The nucleus of every cell in your body contains the complete DNA for building the whole body. What parts of the DNA are switched on and off vary from cell to cell - and from moment to moment within a cell. It is which genes are switched on and off within a cell that differentiate one type of cell from another. Genes provide information for the cell to build proteins inside the cytoplasm (liquid area of the cell) using molecules called RNA (ribonucleic acid). Proteins, in turn, are little factories that produce enzymes, hormones and other chemicals used in our metabolic processes. Notice in the diagram below that only four lego-like molecules make up all of your DNA (Cytosine, Guanine, Adenine, and Thymine) and 4 lego-like molecules make up all your RNA (Cytosine, Guanine, Adenine, and Uracil). These molecules are connected together like legos and form a twisting strand. Each specific DNA molecule matches a specific RNA molecule. When a cell is signalled to make a protein, the DNA strand for that protein unzips at a starting point, enabling matching RNA to attached to it. When a gene is activated, it is unzipped one step at a time, starting at the beginning of the location of the gene. An enzyme (called RNA polymerase) is the zipper that moves along the gene and unzips it. Notice there are matching pairs fit like legos - RNA Adenine matches DNA Thymine, RNA Uracil matches DNA Adenine, RNA Cytosine matches DNA Guanine, RNA Guanine matches DNA Cytosine. So these molecules must be available and floating around in the nucleus to form this RNA molecule. If they are not available then the RNA molecule does not form correctly. Once in the cytoplasm, the messenger RNA attaches to a ribosome (another zipper) which holds the messenger RNA it in place. The ribosome moves along the messenger RNA from beginning to end and as it does it attaches a trancription RNA molecule. Each transcription RNA molecule contains 3 connected lego pieces of RNA molecules that are in turn attached to a specific amino acid on their back end. Those 3 lego pieces of transcription RNA match a specific 3 lego-piece sequence of messenger-RNA. 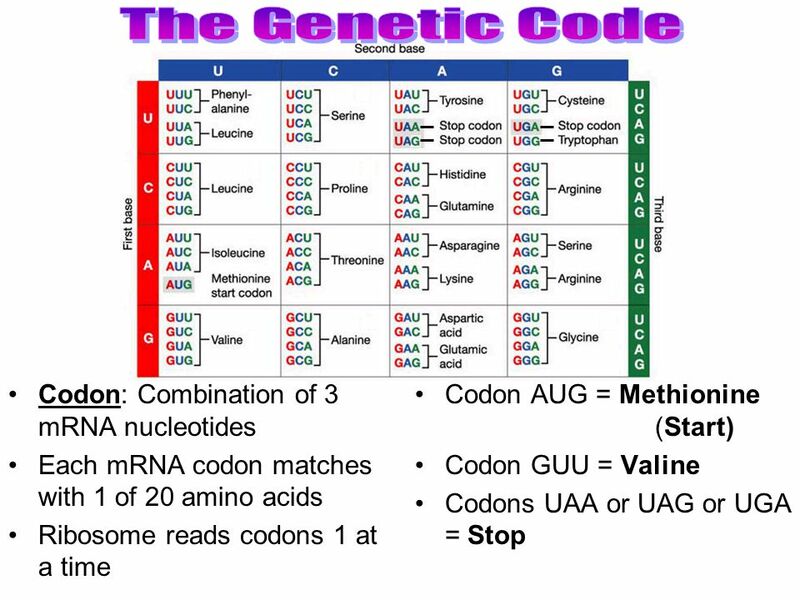 The triplet sequences of three on the messenger RNA are called codons and each codon corresponds to a specific transcription RNA molecule that has a specific amino acid attached. There are 20 amino acids that can be attached to transcription RNA. So each of these groupings from the messenger RNA, called codons, matches an amino acid attached to a specific transcription RNA molecule. To recap, each transcription RNA (tRNA) component is made up of three bases of the RNA lego-molecules, each of which has an amino acid (AA) attached to it. Amino acids are the building blocks of proteins in our body. There are 20 amino acids in the human body. The ribosome holding the messenger RNA, reads it as it passes along the messenger RNA (mRNA) molecule and matches up each component of the RNA with a tRNA molecule. For every three individual components of mRNA, a component of tRNA with an amino acid (AA) attached is matched up. As it moves along the mRNA and matches up tRNA, the ribosome also links the amino acids together. These amino acids are linked together in a chain that forms a protein. Amino acids are the building blocks for the proteins in the human body. Proteins are little machines that do all the work in our body. So these amino acids are strung together by the ribosome and as they are strung together, the tRNA drops off and the end result is a protein is assembled that is made up of only the amino acids. As it is being formed, the proteins chain unzips from the tRNA and folds into a 3-dimensional structure. A protein must be folded correctly to work properly. Folding impacts how and if other molecules can attach (dock) to the protein which is a critical component of how the protein is able to function. What are the Amino Acids that Make Up Proteins? There are 20 amino acids are molecules that are the building blocks used by trascription RNA to build the proteins in your body. Essential amino acids are amino acids your body cannot make itself and must be obtained from food. Proteins are large molecules made up of folded chains of amino acids that do most of the work in the body. These is work include triggering chemical reactions, identifying foreign particles in the body so the body can protect itself, communicating messages between different cells, tissues and organs, providing a support structure for cells (such as some of the proteins that make up our bones), and transporting atoms and small molecules to where they belong. A protein's lifespan is measured in terms of its half-life and covers a wide range. They can exist for minutes or years with an average lifespan of 1–2 days. Movement Allows movement of cells and muscles. Actin and myosin work to move muscles. Enzymes Facilitate biochemical Cytochrome P450 enzymes break down toxins in food. he Human Genome Project has identified 57 human genes coding for the various cytochrome P450 enzymes. Roundup interferes with manuacture of enzymes, which are needed to break down foods including gluten and casein into the amino acid building blocks needed by our body for metabolic processes. 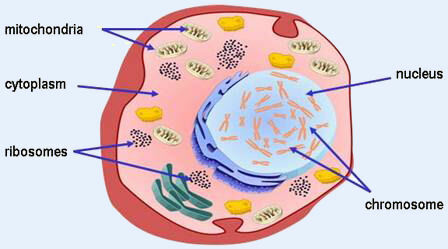 Transport Carry molecules from one location to another or across cell membranes Hemaglobin carries oxygen to the body. Membranes throughout the body are also damaged by exposure to roundup. Hormones Signals between different cell types to stimulate or inhibit activity. Insulin travels in the blood and binds to cells to trigger the uptake of glucose. Neurotransmitters Signals between neurons. Endorphins activate nerve receptors to alleviate pain or stress. Immunoglobulins Recognize foreign substances Antibodies cause foreign material to clump so they can be consumed by macrophages, large white blood cells, neutralized and removed from the body. Cell-surface receptors Identifies a cell as a target for hormones, viruses, growth factors, recognition of cell, and transmission of nerve impulses. Insulin receptors bind to insulin to trigger the uptake of glucose by the cell. Major histocompatibility (MHC) markers allow the immune system to recognize "self" so the body does not destroy its own cells. Now that you've had a look under the hood of your body, you will have a better understanding of what can go wrong and what can be done to fix it. Proteins have to fold correctly and have the right building blocks to work properly. The function of critical proteins is commonly impaired in autism and other health issues. The correct three-dimensional folding of a protein is essential to its function. If the protein does not fold correctly, it may be impaired in its function, be inactivated, or even contribute to toxicity. How the protein is folded determines what other molecules may attach (dock) to it. Not enough of the amino acid building blocks are available to make the molecule. This is frequently the case in autism. A molecule that imitates (mimics) an amino acid is inserted into a protein. One extremely problematic example of this is the amino Glycine is mimicked by glyphosate in the weed killer, Roundup. The DNA for the protein has a genetic mutation (polymorphism) that impairs the function of the protein. For example, mutations in the MTHFR gene impair the body's ability to make methylfolate and to break down artificial form of folate. When not enough folate is available, this disrupts metabolic processes such as methylation in the body and the manufacture of neurotransmitters which require folate. To make matters worse, the artificial form of folate, folic acid, if not broken down, inserts itself into and disrupts these metabolic processes. Misfolded proteins accumulate more rapidly than the body can remove them and then are transmitted from one cell to another. Misfolded proteins are believed to contribute to neurological conditions including autism, depression, Alzheimer's, and Parkinson's. Misfolded proteins are also implicated in causing allergies and other autoimmune conditions. In order to build these proteins we also the nutrients including the amino act to make them. Not having enough or having an imbalance is also common in autism. You obtain all of the nutrients to build and maintain your body through your mouth where it then proceeds down that long tube that runs to the other end of your body that is your intestinal tract. In a healthy intestinal tract, the body secretes substances that enter the intestinal tract to break down the food molecules into readily absorbed and used amino acid building blocks. Organs in the body secrete into the digestive tract hydrochloric acid, intrinsic factor, digestive enzymes such as pancreatin, the CYP450 family of enzymes that detoxify food, and bile salts. A healthy balance of digestive substances in the intestinal tract supports a beneficial colony of microbes and related life forms that live in your intestinal tract. In fact, 2-7 pounds of your weight is this colony, which is also referred to as your microbiome. You have more microorganisms that make up your microbiome living in and on your body then you have cells in your body. In an intestinal tract with chronic infections, which is the case with most individuals diagnosed with autism, there is frequently inflammation, leaky gut (where there are gaps in the intestinal lining and fewer villi lining the intestinal tract to absorb nutrients), reduced production of digestive juices, enzymes and other molecules that break down food into the amino acid building blocks required by the body. When food is poorly digested, it provides a breeding ground for pathogenic microflora to overgrow and crowd out the beneficial microflora that produce nutrients needed for optimal development and maintenance of health. food allergies develop because of the leaky gut - as food molecules come in contact with immune system molecules they wouldn't normally touch. These immune system cells are in inner layers of the intestinal tract and normally don't touch food. The immune cells incorrectly flag these foods they come into direct contact with as foreign invaders to be attacked. Both your digestive tract and your brain manufacture and use neurotransmitters. Neurotransmitters are chemicals that are use by nerves in the brain and body to signal to each other and to trigger neurological growth and development. Neurotransmitters are critical for learning, memory, and behavior. More neurotransmitters are produced in your intestinal tract than your brain, which is why some people refer to the intestinal tract as a second brain. Research indicates that most autistic individual produce too many excitatory neurotransmitters and not enough calming (inhibitory) neurotransmitters. With autism there are generally not enough of some amino acid and vitamin building blocks to make enough of the calming neurotransmitters. Also, when there is chronic intestinal infection, which is common in autism, the body uses up many of the building blocks it would normally use to build the brain and detoxify the brain instead to detoxify the body from the excessive levels toxic by-products being produced by pathogenic microbes and other pathogens that have overgrown in the intestinal tract. Overciting neurons damages neurons. Overexciting neurons can also trigger migraines, and seizures, which are common in autism, especially as children grow older. Because there is maldigestion of food in autism, food is often not broken down properly into its amino acid building blocks. Supplementing directly with amino acids provides them in a form that is readily absorbed and used by the body and brain. If the building blocks are not available to build the brain during infancy early childhood, development of the brain is skewed. The greatest growth in the brain occurs in infancy and early childhood, so the earlier nutritional interventions that provide these building blocks, the better. One super food that tends to have a good ratio of easily assimilated amino acids for most people within the autism spectrum is Chlorella, a form of algae in the plant kingdom. Chlorella has many additional benefits, including Chlorella Growth Factor which supports DNA and RNA repair, it is high in Omega 3 oil which helps to build the brain and is anti-inflammatory, and has a form of fiber that binds to and removes toxins. It is important to get a good quality Chlorella. The main drawback to Chlorella is the taste. It is best taken in a tablet or capsule form. Autism Coach is in the process of sourcing and will soon be offering a high quality Chlorella product. There are lab tests to determine levels of amino acids, so you can determine levels of amino acids, (including the NutrEval tests by Genova Diagnostics). There are also genetic tests to determine if specific genes mutations may be skewing the body's levels of neurotransmitters. Below is a chart of amino acids and related molecules and the levels typically found in individuals within the autism spectrum. Note that these levels can vary from individual to individual. Amino acids best to avoid are highlighted in red, those which are beneficial for some individuals but not others are highlighted in yellow, amino acids that are beneficial for most individuals are highlighted in green. Most of the ones that are to be avoided increase levels of excitatory neurotransmitters. Bear in mind that this chart provides general guidelines, but the amounts and ratios of amino acids required will vary from individual to individual. Finding the correct ratio that will be of greatest benefit can be determined by lab tests or by trial and error.